This recipe can be made vegetarian/vegan by eliminating the chicken! *Frozen or fresh vegetables work equally as well! 1. In a large pot on medium heat, cook cubed chicken with a little salt in a deep skillet with the avocado oil. If you can handle garlic, add some minced garlic with the chicken. 2. While chicken is cooking, chop your vegetables and pour all of your spices into a small bowl. 3. Remove chicken from the pot and set aside. Add spices into pan and stir them around to toast them. This brings out the flavor even more! 4. Pour in tomato puree or sauce and stir well. Simmer for a bit. 5. Add in your vegetables and simmer on low/medium for about 30 minutes, or until they've softened. 6. Stir in coconut cream and chicken. 7. Allow to simmer on low for 30 minutes-1 hour. Stir regularly. The longer it simmers, the better the flavors. 8. Cook basmati rice towards the end of your simmering time. 8. 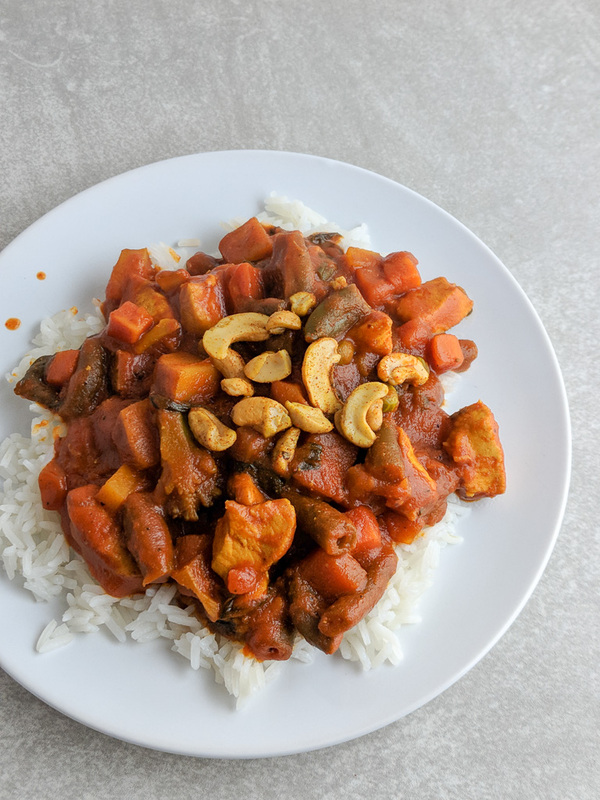 Serve curry and rice together and top with some curry roasted cashews (if you are in low-fodmap elimination phase or do not handle cashews well, omit them)!